We saw the Android-iOS duopoly coming last summer. Now, the effects of this incredibly tight chokehold are becoming painfully evident to virtually every handset maker sans Apple and Samsung. According to a fresh NPD survey from this morning, during the fourth quarter of 2011 Android and Apple together accounted for over 90 percent of smartphone sales in the United States. No wonder RIM is sliding fast. The remaining 10 percent is up for grabs. Apple, which seized the No. 1 crown from Samsung last quarter, and leapt past Samsung and LG to become the best-selling U.S. handset brand, according to NPD. The iPhone maker grabbed 43 percent of all U.S. smartphone sales, while Android devices accounted for 48 percent of devices. 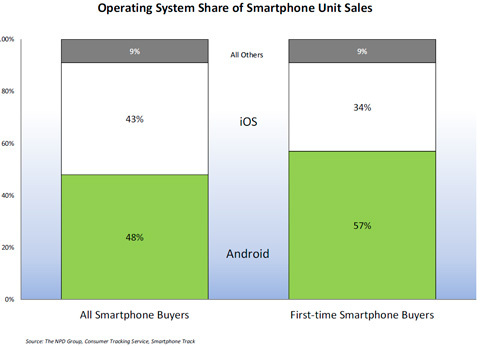 First-time buyers prefer Android (57 percent) to iPhone (34 percent). Smartphones in Q4 represented 68 percent of all cell phones in the U.S., up from 50 percent in the year-ago quarter. Some perspective: HTC today reported fourth-quarter results and blamed Samsung and Apple for a 26 percent income drop. What’s more, HTC devices are nowhere to be seen on NPD’s list of the top five best-selling devices in the U.S. Attracted by a faster processor, improved camera and the Siri speech-driven agent, most iPhone buyers paid a premium for the iPhone 4S, making it the top-selling handset in Q4. NPD also found out that iPhone 4S outsold the iPhone 4 by 75 percent and iPhone 3GS by five to one. Remember, iPhone 3GS is available free on a two-year AT&T contract. Looking at the profits alone, Apple is absolutely king of the hill with an estimated three-quarters of all profits in the handset business as a whole, which is remarkable given the iPhone’s 8.7 percent share of the global cell phone market. UBS analyst Maynard Um said Apple and Samsung will together account for more than half of the smartphone market this year, with industry revenues and sales estimates pegged at $242.8 billion and 1.7 billion units, respectively. 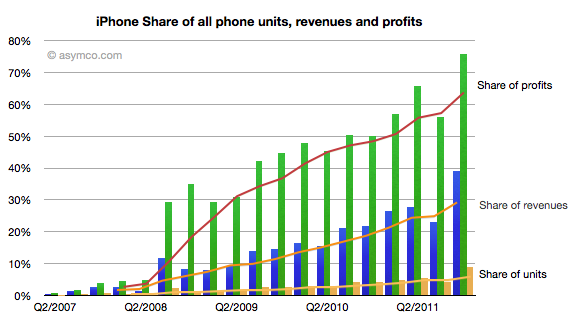 It is important to remember that Apple’s original goal was grabbing a modest one percent of the market for all phones. Needham’s Charlie Wolf noted that so huge was the iPhone 4S launch that it sent sales in Apple’s brick-and mortar stores in “stratosphere.” His chart, included below, illustrated this phenomenon, with those three big spikes representing iPad/iPhone launches and a boost in iPod popularity. 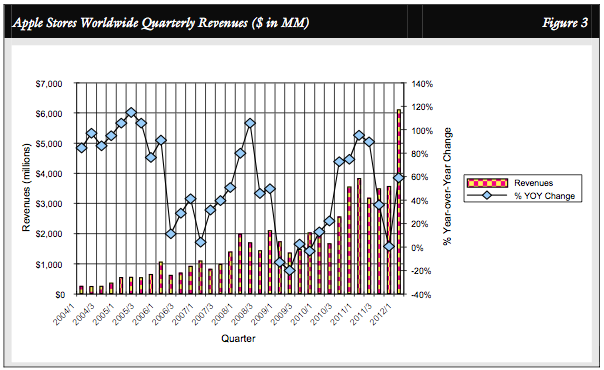 You can visualize Apple’s quarterly revenues using this awesome interactive web tool made by Francesco Schwarz.